Thanks for allowing me to visit your museum. It was a special treat to see the Bil Baird puppets! I sat through as much of the DVD as I could, but didn’t get it all watched (I’m a pacer and that room wasn’t conducive to pacing). I thought it was quite wonderful and would like to buy a copy. I bought the poster, and would have bought the DVD if it was available. I’m friends with a certain Canadian puppeteer. I think he’d dig seeing Bil’s puppets. He’d probably also like watching the DVD (if it plays on Canadian DVD players). His name is Anthony Imperioli and he has an Old Italian Lady puppet that is quite famous on the internets. Her name is Nonna Maria and she’s pretty nutty/crazy. Bil would have loved her! I threw a few bucks into the kitty when I visited your museum (it was all I had on me). 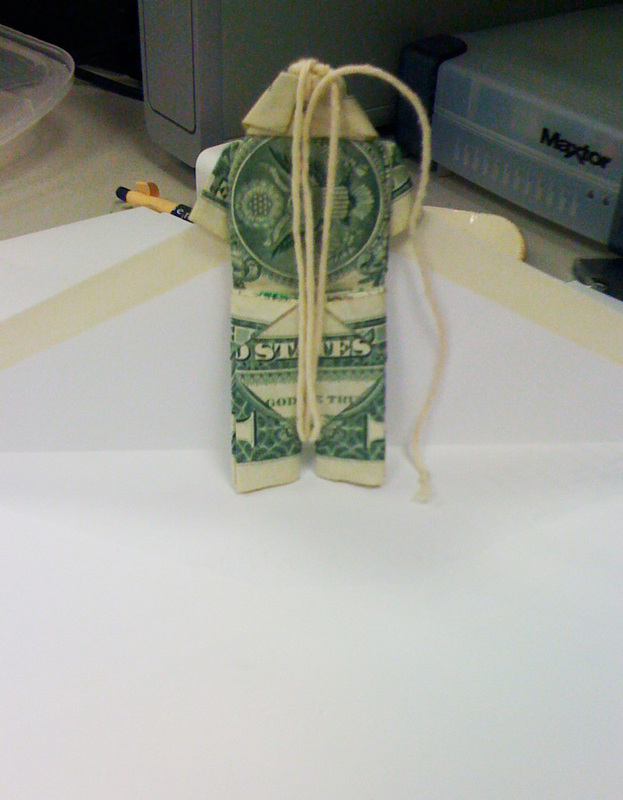 I’m including a couple more dollars in the shape of a shirt and pants on a string. They’re like a little puppet! You can play with them or spend them on something for your museum. Please let me know if the DVD ever becomes available. I’ll probably want two! Thank you for your interest in the Charles H. MacNider Museum and the Bil Baird puppets. It is wonderful to hear from visitors who had a memorable experience at the Museum. We are pleased that you were able to view the Bil Baird DVD. People of all ages appreciate the opportunity to see the puppets brought to life. Originally 16 mm films, we were able to restore and reformat the films with the help of grant funding. The source films are now kept in the freezer to delay the deterioration process, and 10 DVDs were created through the restoration process. Unfortunately, the Museum does not own the copyrights to the films, and therefore cannot sell the DVDs. However, we are working on acquiring the rights so that the DVDs can be sold, and visitors may continue to enjoy the Bil Baird puppets outside of the Museum. The Museum will keep your information on file and alert you if the DVDs become available for purchase. Again, thank you for your kind letter and inventive donation! We hope you can visit again soon. The Anthony mentioned in this letter is the highly talented man that created the Jackass Letters header and the Jackass Letters twitter avatar. His website is: thezimp.com. He has a puppet show on the internet: Nonna Maria, and cane be found on twitter as @mindofchester. You should check him out.